Insomnia is more common than you think. Millions of people experience insomnia every year. Tossing, turning, not being able to shut off your brain to slip into the state of sleep—it is extremely frustrating, and unhealthy. In order to avoid getting insomnia, this essay will explore the causes of this phenomenon so you can be better prepared to prevent and to avoid this pain. The causes of insomnia involve medical conditions, depression, anxiety, lifestyle, and food. There are many medical conditions that engender insomnia. Such conditions as sinus allergies, gastrointestinal issues such as reflux, endocrine problems like hyperthyroidism, arthritis, asthma, neurological issues such as Parkinson’s disease, chronic pain, and low-back pain cause insomnia. In addition, according to the National Sleep Foundation, “…insomnia may be a symptom of underlying sleep disorders. For example, restless legs syndrome—a neurological condition in which a person has an uncomfortable sensation of needing to move his or her legs—can lead to insomnia. Patients with restless legs syndrome typically experience worse symptoms in the later part of the day, during periods of inactivity, and in the transition from wake to sleep, which means that falling asleep and staying asleep can be difficult” (“What Causes Insomnia?”). As one can see, there are a multitude of medical conditions that cause insomnia. A cause more on the mental side, depression, is also linked to insomnia. As stated by WebMD, “Most experts agree that adults need seven to nine hours of sleep a night. But even without depression, according to the National Sleep Foundation, the average American only gets about 6.9 hours. When you add depression to the mix, the problems with sleep are compounded” (“Sleep Deprivation and Depression: What’s the Link?”). In other words, depression is not a direct cause of insomnia, but it worsens your sleep disorder. On the note of mental conditions, anxiety is a common link with insomnia as well. According to the Anxiety and Depression Association of America, “Anxiety causes sleeping problems, and new research suggests sleep deprivation can cause an anxiety disorder. Research also shows that some form of sleep disruption is present in nearly all psychiatric disorders. Studies also show that people with chronic insomnia are at high risk of developing an anxiety disorder” (“Sleep Disorders”). So, anxiety and insomnia are interrelated, and they are both causes of each other. Getting into more practical causes, our lifestyle can be a cause of insomnia. Working at home in the evenings, taking naps in the afternoon, sleeping in, and being a late shift worker all have repercussions, and often to lead a degree of insomnia. The worst thing to happen is to make a habit of these behaviours. 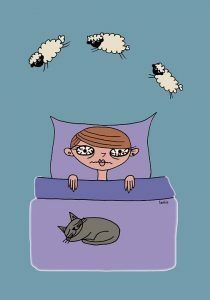 As soon as they become more regular, the deeper you get into the routine of insomnia (“What Causes Insomnia?”). Another practical cause of insomnia is the food we eat. You know the saying, “we are what we eat.” Well, this applies to sleep as well. Fried foods, coffee, alcohol, red meat, spicy foods, and too many liquids can cause us to be insomniacs. Fried foods take a lot for us to break down, and can make our body more active during the digestion process. Coffee is a more obvious cause, as the caffeine it contains can easily make us more uppidy. Alcohol is commonly used as a soother, but it disrupts our sleep cycle. We get to sleep faster with alcohol, but we will wake up often. With red meat, the digestion of such products are also difficult, so it heats up the body and puts it in overdrive. In addition, bad news for spice lovers, as spicy food can cause indigestion and stomach pain, which will keep us up. Probably the most obvious factor is the drinking of many liquids before sleep, which disrupts our sleep cycle by us having to go to the bathroom often during the night (Rountree, Alicia). Overall, insomnia is caused by multiple factors. Myriad medical conditions, clinical depression, anxiety/stress, lifestyle choices, and particular foods cause insomnia in millions of people worldwide. Knowing the causes will help you rest easier, as you know what to avoid in order to rest well. “What Causes Insomnia?” National Sleep Foundation, www.sleepfoundation.org/insomnia/content/what-causes-insomnia. “Sleep Deprivation and Depression: What’s the Link?” WebMD, WebMD, www.webmd.com/depression/guide/depression-sleep-disorder#1. “Sleep Disorders.” Anxiety and Depression Association of America, ADAA, adaa.org/understanding-anxiety/related-illnesses/sleep-disorders. Rountree, Alicia. “These 6 Foods Are the Reason You Can’t Sleep, According to a Nutritionist.” TheThirty, The Thirty, 12 Oct. 2018, thethirty.byrdie.com/foods-that-cause-insomnia.